I used to fall regularly at my hurried pace when traversing gravel, horse pastures, and uneven dirt roads. A stumble in a field of long-stemmed grass cushioned my body more than a fall on compacted dirt or concrete. I rose, brushed myself off, and continued onward in Humpty Dumpty fashion. This forced me to be mindful every moment, every breath, and every step. Two of my guidance counselors along the way pleaded: “Slow down, lie down, and breathe in life, Andrea.” I might recline for a few moments only to jump up and scurry outside for a chore or to tend an animal. Living in a physical whirlwind, I wouldn’t sit still for even a moment while driven to do, do, do. I depleted my reserves of energy on animals, businesses that never got off the ground and weren’t meant to be, and helping people who would have been better off learning to do it on their own. My small herd of horses required a tremendous output of energy to train, feed, exercise, and groom them. Strong and lean, I dug three foot deep holes and dropped an eight foot long telephone pole in each one for never-ending fence maintenance. The Bible instructs to respect your personal needs and rest when fatigued. Over worked mental and emotional faculties could not be ignored. 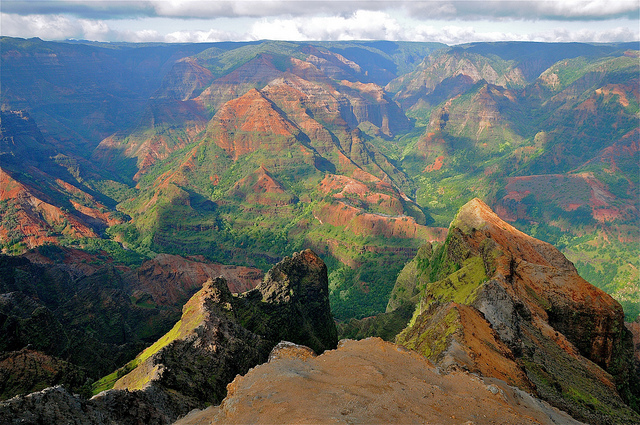 Returning home exhausted after a day of business around the island of Kauai, I always had an extra reserve of energy to gulp an elixir of oxygen at the 3,500-foot elevation Waimea Canyon Lookout. After many years of push and strain in continual activity, little by little my strength and reserves depleted. Once I accepted the need for help, a crudely constructed staff from a native Hawaiian wood, two sticks, a walker, a scooter, and later a wheelchair, helped me mobilize. Navigating on concrete and smooth terrain allowed me to walk easier than dirt and grass where my legs felt like cement blocks and struggled to lift and take a step. Oh, the clamor of these days! In our fast-paced, stressed-out world, people are unable to focus and know the delight of present time. Americans live in less than forty percent awareness. Running here and there, different energies, appearances, foods, smells, sounds, television, and radio, all disrupt the brain and concentration. We are held prisoner to inner chatter and “to do” lists. When crossing a street on my scooter, there is never any guarantee that distracted drivers will heed a slender woman on a mobility vehicle. You can be sure, my arms wave in the air as a defense mechanism. The dictionary describes meditation as devout religious contemplation or spiritual introspection. Eastern philosophy states we should be able to sit in the middle of a busy intersection and meditate while oblivious to the noise around us. Meditation can be a viable source of perception and a way of unwinding for everyone. I hear talks on the radio given by doctors claiming the benefits of meditation for health and well being. Most people also fail to take in enough oxygen in day to day breathing which stabilizes the nervous system, centers emotions, and calms your mind. Years later, I learned how to disregard the hustle and bustle of everyday crisis and setbacks, which get in the way of what truly matters. Exhaling trauma dissipates anxiety, time pressure, agitation and worry, opening the way to balance and peace. 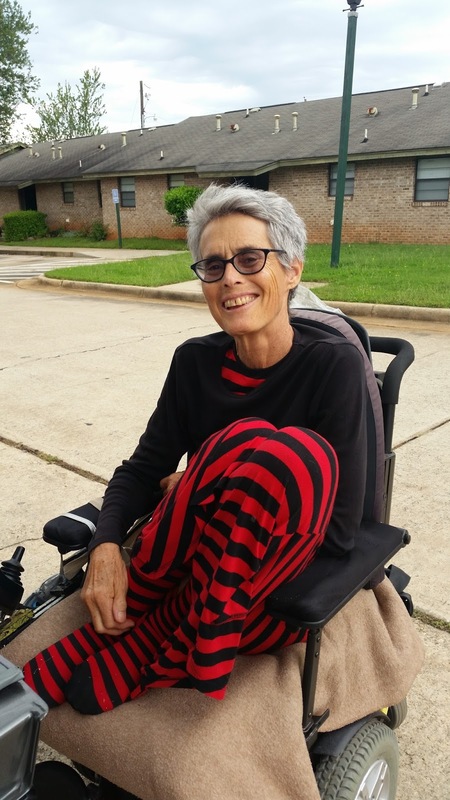 Once I began spending more time in a wheelchair, my body and mind could sit and relax, move without moving. “Slow movement abolishes adhesions and the grip of whatever we are holding onto, with pain a function of resistance,” one of my advisers once told me. I practice “Centering prayer” as a form of silent prayer meditation. Finding a quiet place to get comfortable, I begin breathing deeply to clear my mind. A “mantra” or word helps me to focus and empty the brain. Every time impressions come, I just keep letting them go as I return to my mantra. When first beginning to meditate, start with five minutes at a time and then work your way up to a duration which feels restful and effective. Practice makes perfect! Once the brain and body are quieted from busyness, the door is opened to hear the still small voice within. My teacher Philip once said: “We need to watch what the mind chooses to manufacture. Meditation, used correctly, can keep you from getting hung up in thoughts that drain energy away. To take a break for two or three breaths can relax the brain and give perspective to loosen the tight structure within. Feel the waves crashing and breaking on a sandy beach, or fly off a waterfall on a 1000 foot cliff as the wind picks you up and turns you into small drops. If you have overflowing energy you can throw some away, otherwise, you better be real sure what you do with it.” Those words continue to resound in my head as a reminder to live mindfully while slowing down and not moving too fast. 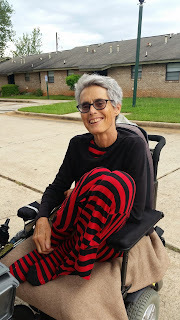 I have a difficult time saying it’s a good thing I ended up in a wheelchair, but I must admit that a lot of positive benefits have been a result of my confinement to primarily the sitting position. When I was up and running, I did move too fast and thus found myself unable to truly be present and focus on life. Coupled with my transformation from the world of physicality to spirituality and subsequent relationship with God, life has taken on more joy and meaning for me.